Check out our front window display highlighting some of our library’s resources by Hispanic authors and about Hispanic cultures, and be sure to let a librarian know if you want to take any of the display books home to read– anything in the front windows is available to check out. Just ask! 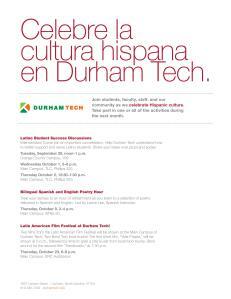 Around Durham Tech, there are some exciting events planned to celebrate, including several Latino Student Success Discussions, a Bilingual Poetry Hour, and a Latin American Film Festival (and food trucks!). Click on the flier to see more details. Credo Reference is an online database of more than 3 million entries in over 600 reference books. It is helpful when you’re developing a topic for an assignment, because it provides brief topic overviews and links to related entries in Credo Reference resources. You can also follow links from Credo Reference into other resources provided by the Durham Tech Library, including the library catalog and online databases. Additionally, you can browse reference books by subject area, use the “image search” option to find pictures related to a topic and explore the “mind map” search strategy to brainstorm and discover related terms to your search term. When you have become comfortable with the basic searches, the “advanced search” feature allows you to be more exact in your search strategies. If you are feeling very confident and a little adventurous, also check out the “power search” tips from the “advanced search” page. New Resources from NC LIVE! If you have been studying at Durham Tech for a couple semesters, you are probably familiar with some of the article databases and other research tools that are available through NC LIVE, such as Academic Search Complete and Newspaper Source Plus. This semester–and continuing through 2017–NC LIVE is subscribing to some new resources you’ll want to use! Other changes include adding Pronunciator, a language learning service; Gale Literature Resource Center for literature research; and streaming videos from Films on Demand! A complete list of the subscription changes is available on the NC LIVE website. Remember that you can find links to the electronic resources provided by your library from the library’s website. All of the ProQuest databases are already available to everyone affiliated with Durham Tech, so you can start using them if you haven’t already checked them out. Other new databases will become available in early 2015. We also will continue to provide access to the EBSCOhost databases through December, though our subscription expires then and you won’t have access to them after that. 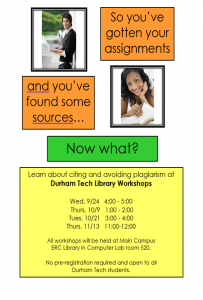 If you need more information about these changes, please contact the Durham Tech Library. I think that there are few things more wonderful than new books, but I acknowledge that, being a librarian, I’m biased. See a full list of the gems recently added to our collection in this PDF: New Books. This alarming book tells a crime story that takes place thousands of miles away, in countries that few of us may visit. But like the trade in illegal drugs, the traffic in elephant ivory and rhinoceros horn has far-reaching implications not only for these endangered animals, but also for the human victims of a world-wide surge in organized crime, corruption and violence. This is a series of stories unified around one theme: people who use the interface between the human and the natural world to contend with their modern challenges in love, loss, and family life. These are vibrant, weighty stories that herald the arrival of a young writer of surprising feeling and depth. Looking Out, Looking In: Anthology of Latino Poetry. William Luis, editor. This twelfth edition continues its outstanding tradition of combining current information with a fun, reader-friendly voice that links course topics to your everyday life. In May 2013, Glenn Greenwald set out for Hong Kong to meet an anonymous source who claimed to have astonishing evidence of pervasive government spying and insisted on communicating only through heavily encrypted channels. That source turned out to be the 29-year-old NSA contractor Edward Snowden, and his revelations about the agency’s widespread, systemic overreach proved to be some of the most explosive and consequential news in recent history, triggering a fierce debate over national security and information privacy. Read the article here about University of Georgia’s Malcolm Mitchell and the book club he joined to help him improve his reading. Wait, but what about the touchdowns? While we don’t have a book club, we do have lots of great books for you to check out in the library, including The Hunger Games trilogy. See how fast you can read them. Meet Our New Library Staff! The Durham Tech Library is very pleased to welcome new members to our team as well as announce some additional updates to our staffing. Our new staff members look forward to working with you so please stop by and introduce yourself! Courtney grew up in the Raleigh/Durham area and has a Master of Science in Library Science from UNC Chapel Hill. An avid coffee drinker, she also enjoys tea with a good book. Courtney loves science fiction/fantasy and is always available for a friendly discussion about either. Hobbies include dancing, reading, writing, and the occasional adventure. Stephen has worked in libraries for over 20 years at UNC Chapel Hill, Asheville – Buncombe Technical Community College, UNC Asheville and George Mason University. He has a bachelor’s degree in English from UNC Chapel Hill and a master’s degree in library and information studies from UNC Greensboro. He is an avid boardgamer, decent tennis player, and devoted father and husband. Stephen’s favorite book is Infinite Jest by David Foster Wallace. Before joining Durham Tech’s library in January 2013, Lauren had worked at UNC-Chapel Hill, Durham County Library, and the EPA. She and her husband welcomed a baby girl in February, so Lauren has been enjoying the adventure of parenthood… and of course reading many wonderful children’s books! In her spare time, Lauren enjoys blogging, reading (naturally), playing board games like Galaxy Trucker, and catching up on television series like Gravity Falls and Justified. Meredith Lewis works in both the Orange County and Main Campus libraries. A former English teacher, she recently completed her Masters in Library Science at UNC-Chapel Hill and is excited to continue working at Durham Tech after interning and working part-time through the 2013-2014 school year. Professionally, she’s interested in curriculum design, online learning, and meeting the needs of diverse student populations, especially how it relates to library support. Personally, she’s into arts & crafts, cats, cheesy puns, and reading mostly non-serious books. Avoid Plagiarism! 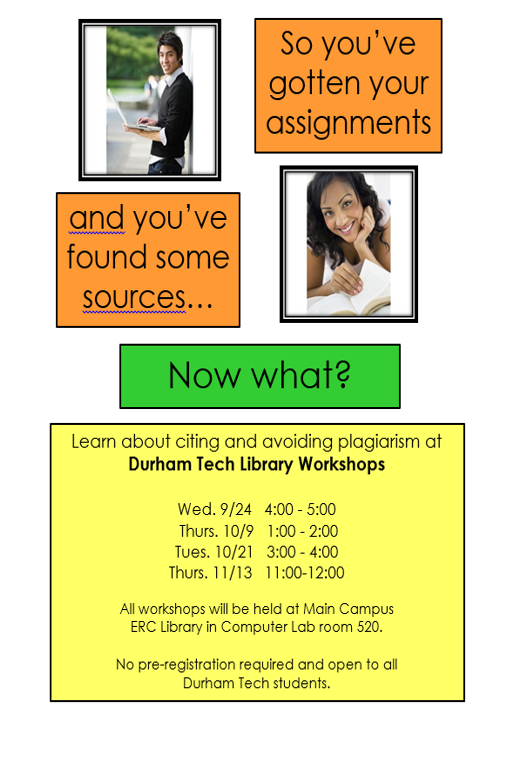 Attend a Citation Workshop this semester.